WHO Affirms Use Of Birth Control Injections After Weighing HIV Risks : Shots - Health News The WHO upheld its guidelines on the safety of hormone injections for contraception yesterday, despite some data that users are at increased risk of HIV transmission. An expert panel says the evidence isn't solid yet, and at-risk couples should use a second method, like condoms, for HIV prevention. 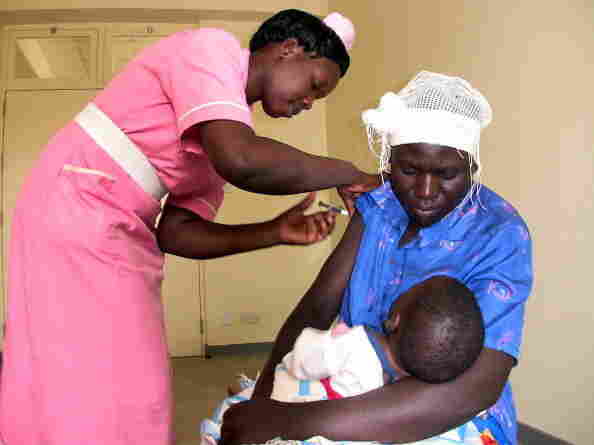 A health worker injects a woman with a shot of Depo Provera, a quarterly contraceptive injection, at a health clinic in Busia, Uganda, in 2009. Women living with HIV, or at high risk of infection, should continue to use hormone injections to prevent pregnancy, the World Health Organization said Thursday. But the advice stressed that couples should use an additional protective method, like condoms, to prevent HIV transmission between partners. The update comes after an expert review of data on the link between hormone injections and HIV transmission. A study in Lancet Infectious Diseases last year found that hormone injections nearly doubled the chance that a woman would pass HIV to her partner, or contract it from an infected partner, as Shots reported. The study was particularly worrisome for African communities, as NPR's Richard Knox reported. Hormone injections are the most popular form of contraception in Africa, which according to a 2009 UN report is also home to 23 million people living with HIV or AIDS — almost 70 percent of the world's total. That put public health officials in a bind. Unintended pregnancies carry lots of risks, so women's access to contraception is a high priority. And hormone injection is particularly convenient for African women. It's discreet, lasts for months and there are no pills to keep track of. But HIV prevention is also a major concern, and it wasn't immediately clear how health officials would pursue both goals. At the end of January, WHO convened a panel of 75 experts from 18 countries to go over all of the relevant scientific literature on hormone injections and HIV. They concluded that women in at-risk populations should continue using hormone injection to prevent pregnancy, in keeping with WHO's 2009 guidelines. But the panel reiterated that condoms are the most reliable method for preventing both HIV and pregnancy, so couples in which one partner is infected should always use a condom, regardless of their use of other contraceptives. Yesterday's statement confirmed that WHO's Guidelines Review Committee had accepted the panel's recommendations, but did not shed much light on the basis for the decision. Shots turned to Amy Tsui, professor at Johns Hopkins Bloomberg School of Public Health and director of the Bill and Melinda Gates Institute for Population and Reproductive Health, for help understanding the decision. Tsui, who was not involved in the deliberations, says the literature hasn't provided solid evidence that hormone injections really do increase HIV risk. "Some of the issues have to do with the usual science banter" about study design, both in the Lancet study and in others, Tsui says. While some studies have found a link, she says, others have not. Few of the studies were designed specifically to test for that relationship. Tsui agrees with the WHO's support for further research into the possibility that the risk is real. But for now, she says, "on the whole it looks safe."